Christer Fuglesang, a former physicist who worked at CERN and now an European Space Agency (ESA) astronaut brought back to CERN a neutralino he had taken along on his mission to the Internal Space Station in 2009. 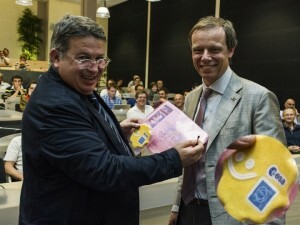 Yesterday, Christer Fuglesang (right) former physicist from CERN and now astronaut with the European Space Agency, brought back to Sergio Bertolucci (left), CERN research director, the neutralino bearing ESA and CERN colors (bottom right insert) he took with him onboard the space shuttle in 2009. The said neutralino is in fact a stuffed toy created by particle zookeeper Julie Peasley, creator of the Particle Zoo. It represents a hypothetical fundamental particle proposed within a new theory called supersymmetry. This theory builds on the Standard Model, the actual theory in particle physics and would unify together particles of matter and particles associated with fundamental forces. Most importantly, many hope this neutralino could be a new form of matter that would explain what dark matter is made of. Dark matter is a completely unknown type of matter that makes up 23% of the whole content of the universe, while only 4% of the universe corresponds to the type of matter that makes humans as well as all stars and galaxies. Physicists still don’t know what makes dark matter and dark energy (the remaining 73% of the universe’s content) but we know it’s there through its gravitational effects. 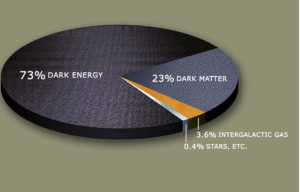 The universe contains 23% dark matter and 73% dark energy, two forms of matter and energy completely different from the regular matter found on Earth, all stars and galaxies, which accounts for only 4% of the content of the universe. Dark matter does not radiate any light (hence its name) but still generates a gravitational field, making its presence detectable. On the other hand, it seems to interact very minimally with ordinary matter, making it very difficult to detect it and study its nature. One hope is that the Large Hadron Collider (LHC) might be able to produce dark matter particles and physicists would at last get a chance to study them. The neutralino is only one of many proposed candidates to explain dark matter but a very plausible one. So when Christer Fuglesang was told he could take a few mementos with him on his trip to the International Space Station, he chose to bring something special from CERN. “The neutralino offers a nice connection between space and particle physics”, Christer said, making it the perfect choice. The little softy is now reunited with all its friends, the other particles from the Particle Zoo. Let’s see which one of them will pop-out of the box being the one explaining such a huge amount of matter still unaccounted for. Let’s hope the LHC will manage to shed light on this dark side of the universe.